A bunch of Dubai photographers are getting together to present personal projects at Slidefest. Organised by Dubai photoguru Mohamed Somji, it promises to be a fun and enlightening evening of fantastic photography. I am showing a project that was conceived and created with local ad guru, actor, writer, poet and god knows what else, Jamal Iqbal. We call it Point Counter Point. Come on out on and see what us Doobai photographers have been upto. 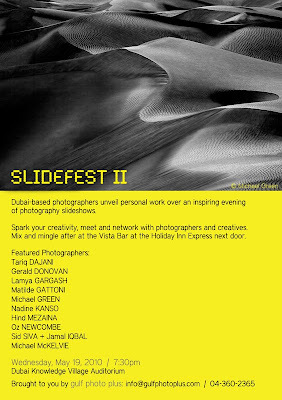 Slidefest II will be held at the Knowledge Village Auditorium on May 19, 2010 at 7:30pm.